It’s October, and by now the fledglings of spring will be on the wing, making their own way in the world and ready to face their first winter. But one of the class of 2017 has hit a worrying bump in the road to adulthood. 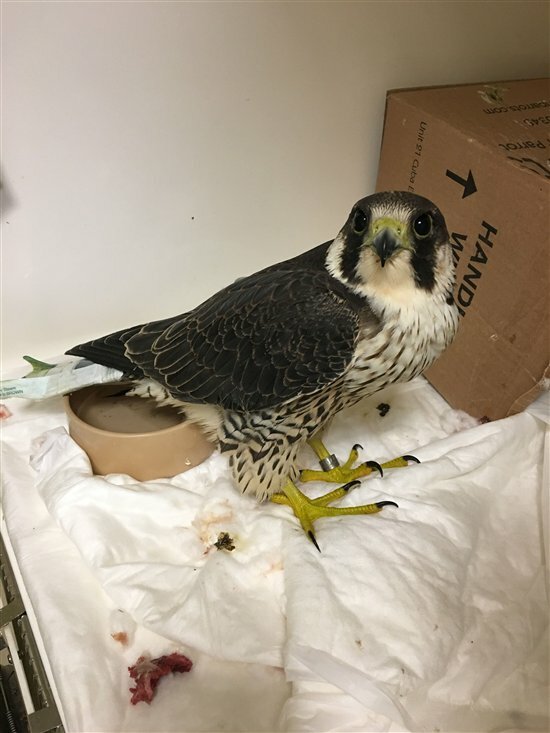 Last month (September), a juvenile peregrine falcon was discovered by a member of the public on the outskirts of Cambridge. It appeared the bird had been grounded for several days. The peregrine was taken to the Raptor Foundation nearby, who contacted police and the RSPB. When the bird was x-rayed, it was clear what had happened. The bright white shape of an air rifle pellet could be seen lodged in the peregrine’s shoulder: this bird had been shot. There was also a fragment of metal in its wing, preventing the bird from flying. Vets believe the bird could have been shot up to two weeks before it was reported, living with the pellet lodged in its body. It is now being looked after at the centre, and receiving physiotherapy. From the ring on its leg the bird was identified as one of three that fledged from a nest on the outskirts of Cambridge earlier this year. Like all birds of prey, peregrines are protected by UK law. Anyone found guilty of killing or harming a peregrine could face an unlimited fine and, or, six months in jail. Peregrine falcons are the fastest birds in the world, still no peregrine is a match for a gun. Usually it's a joy when magnificent raptors like these make a home in our cities - they bring an exciting flash of wilderness to our domestic routines and there's no reason why humans and peregrines can't live shoulder to shoulder. Still, someone has clearly, deliberately shot this bird. We urge anyone with information to come forward – it’s information from people like you that can (a) alert us to grounded birds of prey and (b) help police find out who’s responsible. "This was a senseless act, causing injury and distress to a protected bird,” said PC Alun Bradshaw. "I'd encourage anyone who has information about this incident to contact the police and the RSPB. Doing so might prevent other wildlife from being harmed in the same way." If you have any information relating to this incident, call Cambridgeshire Police on 101 using the reference number CF0539270917. If you find a wild bird which you suspect has been illegally killed, contact RSPB Investigations on 01767 680551, email crime@rspb.co.uk or fill in the online form.